The only difficult part about this French family favorite is saying the name. This is a flavorful savory dish that's been difficult to make for centuries. Now, there's no mess, no stress, and no shopping or chopping multiple ingredients. It's all included - just add it to your slow cooker before you leave for the day and it's ready when you get home. 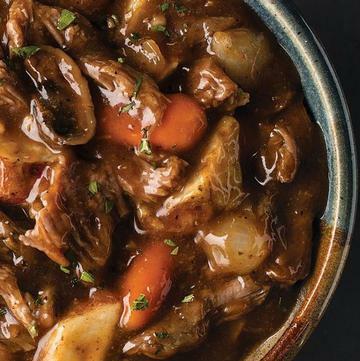 The best ingredients make your slow cooker speak French... juicy, beefy sirloin tips will braise for hours in a sauce with Burgundy wine and flavorful beef broth and just a hint of smoky bacon. Rounding out this deeply rich stew are big chunks of colorful vegetables including roasted skin-on red potatoes, baby carrots, roasted marinated mushrooms, and pearl onions. Each package feeds a family of four - even the kids will love it! Meal serves 4 to 8. FOR FOOD SAFETY AND QUALITY, FOLLOW THESE COOKING INSTRUCTIONS. FOOD MUST BE COOKED TO AN INTERNAL TEMPERATURE OF 165�F AS INDICATED BY A FOOD THERMOMETER. Preparation: READ INSTRUCTIONS THOROUGHLY. Instructions based on 6-quart slow cooker. Appliances vary; adjust cook time accordingly. Do not thaw. Keep frozen until ready to cook. Remove contents from box. Carefully open bag with vegetables and remove 2 sauce pouches. Return vegetables to freezer. Place beef and sauce pouches under cold water to loosen film. Open beef pouches and place beef in slow cooker. Wash hands thoroughly after handling raw beef. Open sauce pouches and add sauce and � cup water to the slow cooker. Cook on LOW 8 hours or HIGH for 6 hours. Without stirring, add vegetables to the slow cooker for last hour of cook time. Stir and serve. Instructions based on 4-quart slow cooker. Appliances vary; adjust cook time accordingly. Do not thaw. Keep frozen until ready to cook. Remove contents from box. Carefully open bag with vegetables and remove 2 sauce pouches. Return vegetables to freezer. Place beef and sauce pouches under cold water to loosen film. Open beef pouches and place beef in slow cooker. Wash hands thoroughly after handling raw beef. Open sauce pouches and add sauce and � cup water to the slow cooker. Cook on LOW 8 hours or HIGH for 6 hours. Without stirring, add vegetables to the slow cooker for last hour of cook time. Stir and serve.